People who lost their water supply during the floods in Gloucestershire have been told they will not be able to claim compensation. Severn Trent said the events leading to 350,000 people being without drinking water for up to 17 days were "completely unprecedented". It added that normal rules for compensation did not apply. 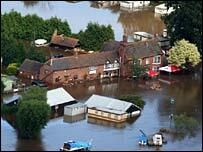 The company said it was giving £3.5m to communities affected by flooding in lieu of compensation. The cash will be given to the local authorities in the area to spend. Water industry regulator Ofwat welcomed the £3.5m donation as the industry-wide compensation plan called the Guaranteed Standards Scheme (GSS) cannot be utilised. A spokeswoman said: "The provisions in the Guaranteed Standards Scheme do not apply in exceptional circumstances such as the severe and unprecedented levels of flooding we have seen in recent weeks." Under the GSS, domestic customers are entitled to £20 plus an extra £10 for each 24-hour period that supplies remain down during unplanned interruptions. 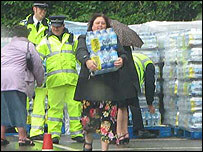 The compensation only applies if supplies are not restored within two days if the leak or burst is in a strategic main. Business customers are entitled to £50 plus a further £25 for each 24-hour period the supply remains off. But Neal, from Gloucester, contacted the BBC in frustration at the lack of individual compensation. "Severn Trent makes a lot of profit from their business," he said. "Their performance during the crisis, though commendable, was not perfect. My household would have been without water but for support from my family. "It's more than a little unfair that most of the people of my area won't be compensated. It is scandalous." Severn Trent Water's managing director, Tony Wray, said councils were best placed to know where the £3.5m should be spent. He said: "This incident has been unprecedented. The scale of this operation went far beyond our previous experience, or that of any other water company." Mr Wray also paid tribute to everyone who had kept emergency supplies going. Severn Trent estimated the cost of dealing with last month's floods as between £25m and £30m. Mr Wray said the company had been a victim of the floods as well and hoped to recover between £10m and £20m from insurers. Residents in 140,000 homes across Gloucestershire were unable to drink mains tap water for 17 days after the Mythe Water Treatment plant in Tewkesbury was deluged and shut down during the height of the flooding. It took about 10 days for water for sanitation uses-only to be restored to the county. Since the start of the incident, Severn Trent said it had bought and made available 50 million litres of bottled water and deployed more than 2,000 staff from Severn Trent Water and its contractors to deal with the crisis. "The priority for Severn Trent was always the provision of alternative sources of water and the return of normal water and sewerage services which we have now done," Mr Wray added. "Throughout the entire incident we have had the organised backing and practical support from the emergency services and other agencies at Gold Command, all of which provided tremendous support at a time when our own resources were fully committed."